The Darkening’ is the Northumbrian name for twilight, but this band’s music blazes fiercely…. Musicians from Northumberland, Scotland, Ireland and England invoke the dark, powerful, sounds of Ancient Northumbria and broadcast them to the modern world. Their inspiration comes from the wild, dramatic, weather-bitten countryside along Hadrian’s Wall, which seems so quintessentially Northumbrian… and yet, almost 2000 years ago that same landscape was inhabited by people from around the world, worshipping different gods and following different customs. Fresh sounds merge with ancient influences. Expansive sonic textures are created. Dazzling duets from Kathryn’s pipes and Amy’s accordion contrast with the riffs and rhythms of Kieran’s octave mandolin. Intrepid world-traveller Kate adds her fearless explorations. The inventive use of drums and percussion unites the ensemble. “I can’t remember feeling so exhilarated by such a match of music and landscape.” Richard Morrison, The Times (on Kathryn’s Northumbrian Voices). 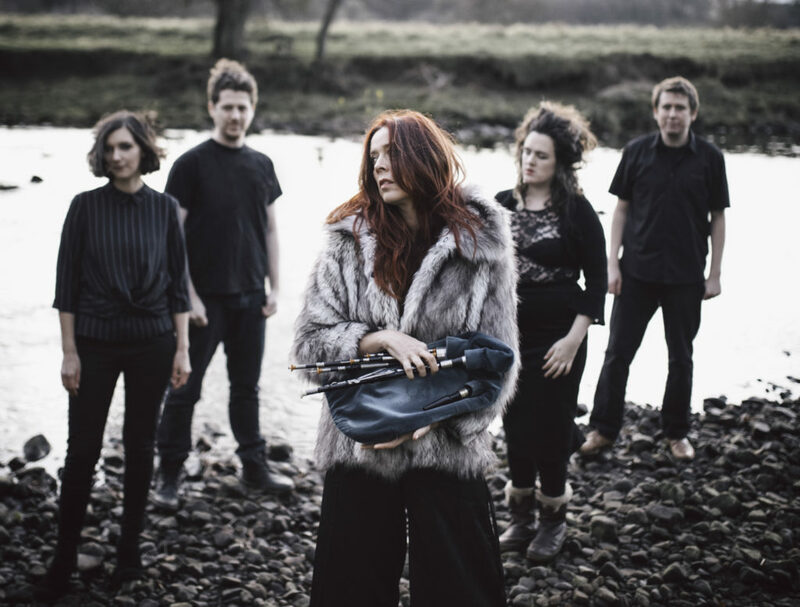 Kathryn Tickell is a Northumbrian piper, fiddle player, composer, educator and broadcaster. Her work is deeply rooted in the landscape and people of Northumbria. Kathryn has released 15 of her own albums and has also recorded and performed with Sting, The Chieftains, The Penguin Cafe Orchestra, Evelyn Glennie, Andy Sheppard, Joanna MacGregor, Jon Lord, Royal Northern Sinfonia and many others. In 2009 Kathryn was presented with The Queen’s Medal for Music, awarded to those deemed to have made an outstanding contribution to British music. She has twice won Musician of the Year at the BBC Radio 2 Folk Awards and was awarded the OBE in 2015.